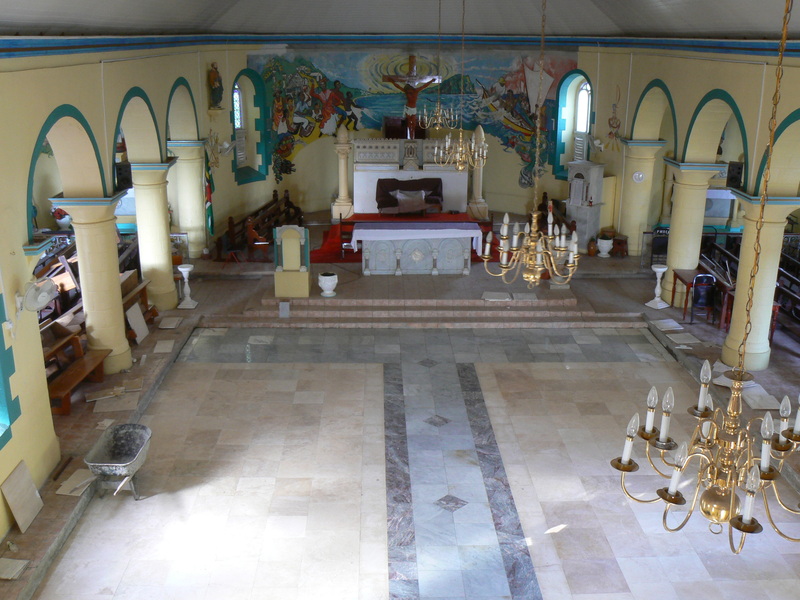 The cleaning and painting works are advancing slowly but surely at the Dominica’s National Shrine at Pointe Michel. Below are some images from October 21, 2016. 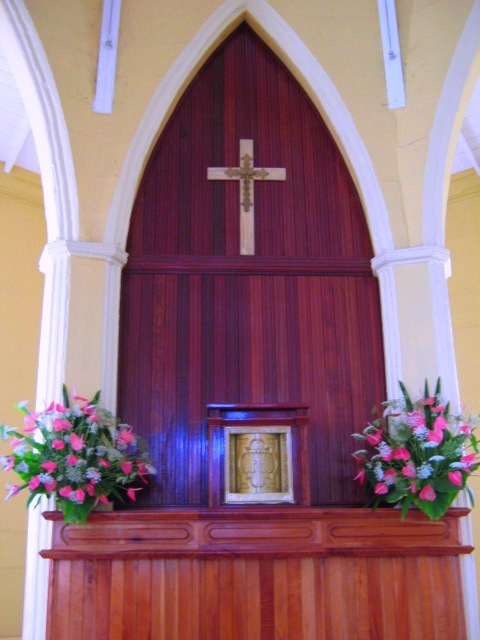 This entry was posted in Dominica's National Shrine, Our Lady of La Salette shrine, renovation works at Dominica's National Shrine at Pointe Michel church after the fire in July 2016, Uncategorized and tagged catholic, churches, Place of Worship, Pointe Michel Catholic church after the fire on October 20, 2016 by Bernard Lauwyck. 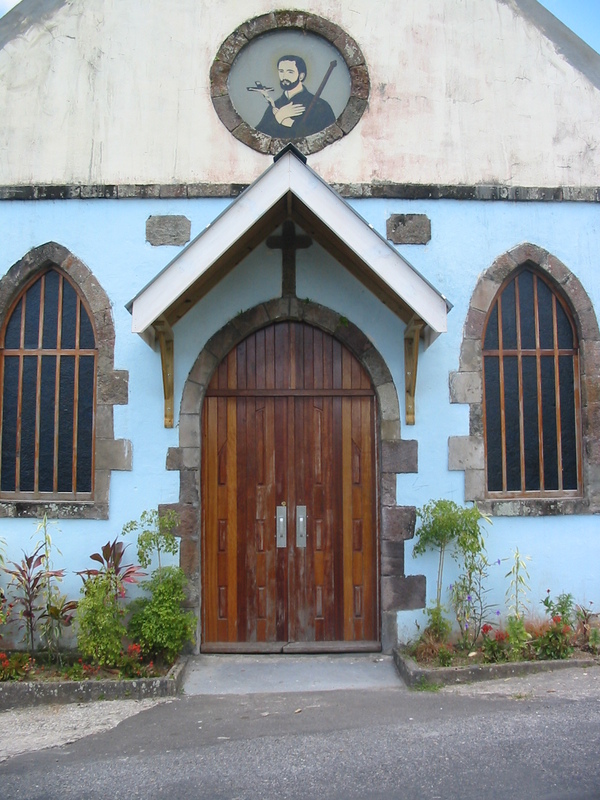 One of our oldest and most beautiful churches in the Diocese of Roseau is the church in Soufriere. This small church is worth visiting as it is a real treasure. Over the last 10 years a huge amount of work was done by several priests to preserve and beautify this church and I am honoured to have been part of every phase of restoration and renovation. The Parish Church of the St. Mark’s Parish was built by Rev. Fr. Antoine Auguste VERGNE of the FMI congregation (Pères de Chavagnes, France). He became Parish Priest of Soufriere on the 21st of December 1876 and remained at Soufriere till his death, 30 years later, on 31st July 1906. His dedication and tremendous efforts in this parish were recognized in a memorial plaque in the church. On his arrival in the parish in 1876, he met a dilapidated church building, which in his own words was “unworthy of the God of Tabernacles”. 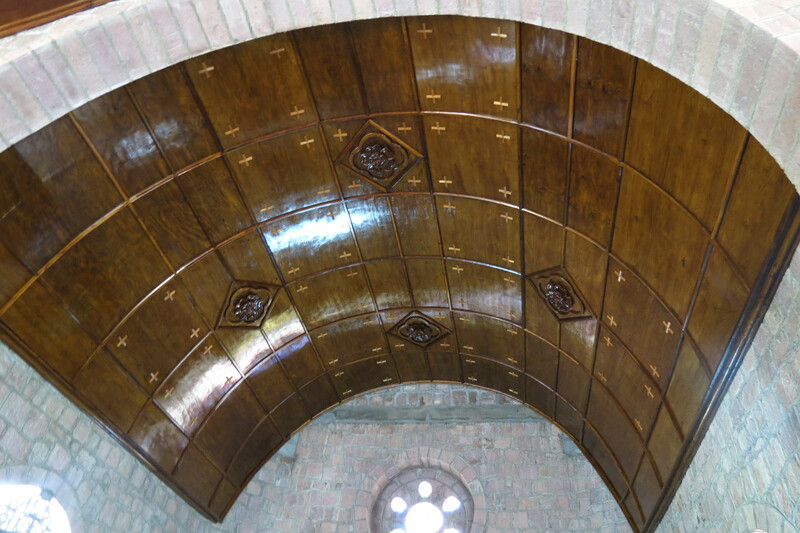 He first extended the sanctuary and constructed a new sacristy behind it. Then the existing Marian chapel , “Chapelle de la Vierge” was enlarged. To make the church cruciform, another side-chapel was erected on the opposite side. All walls of the old church building and the roof were raised to their proper height. But Fr. Vergne did not stop there : a choir loft was added and a magnificent belfry with winding staircases, all in concrete. 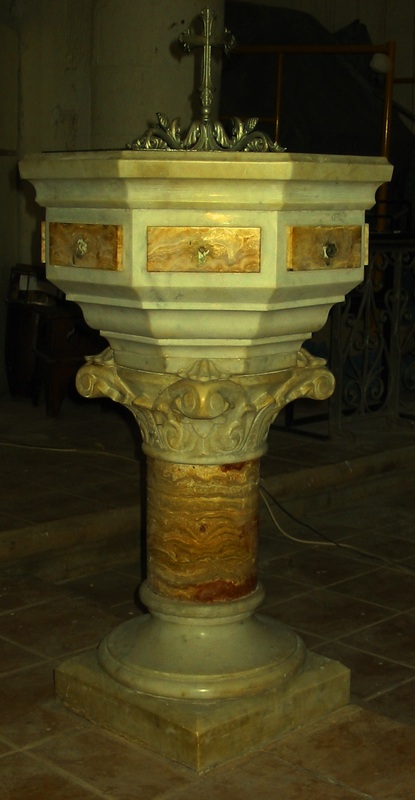 He finally imported from France, three beautiful marble altars and a baptismal font to match them. The installation of brand new church pews and “artistically “ iron-wrought Communion Railings completed the beautiful church. Some of his works, especially the exquisite tabernacle and baptismal font and part of the communion rails can still be admired today. Sadly the high Altar was broken up in pieces after Vatican II to create the present altar and the tabernacle stand. The yearly pilgrimage of Our Lady of Lourdes was initiated by Fr. Henry Lorieau on February 11, 1914, with the approval of Bishop Philip Schelfhaut C.Ss.R, fifth Bishop of Roseau (1902–1921). This pilgrimage has met astonishing success every year since, up to this day. 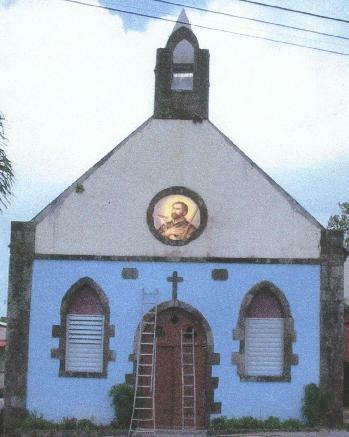 In 1995, hurricane Luis removed part of the roof, which was promply repaired by Fr. Clement Jolly, C.Ss.R. 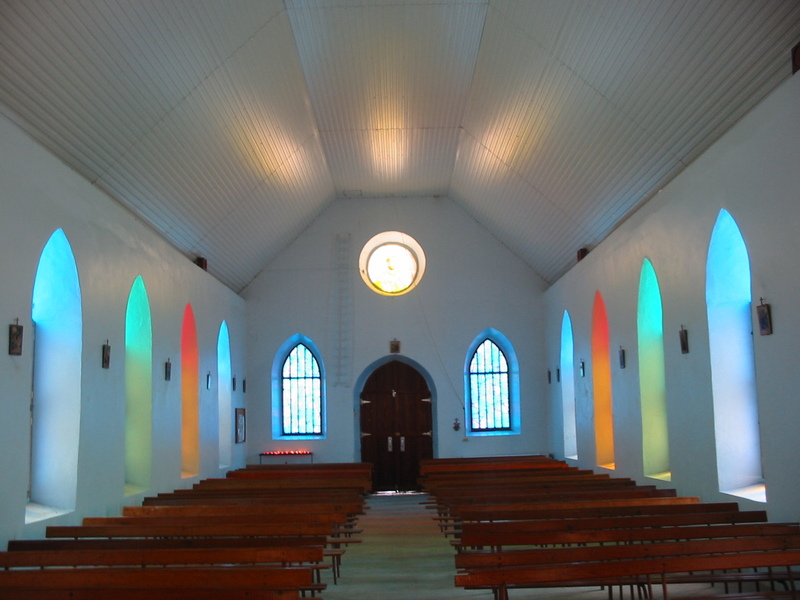 In 2004 Monsignor William John Lewis, with the assistance of DJ sister Jeannette Pelletier, started the renovation of roof and ceiling of the Soufriere church. These works done by a local team were conducted by foremen Peltier and Etienne. Electrical and painting works followed, the latter done by Diocesan workers. 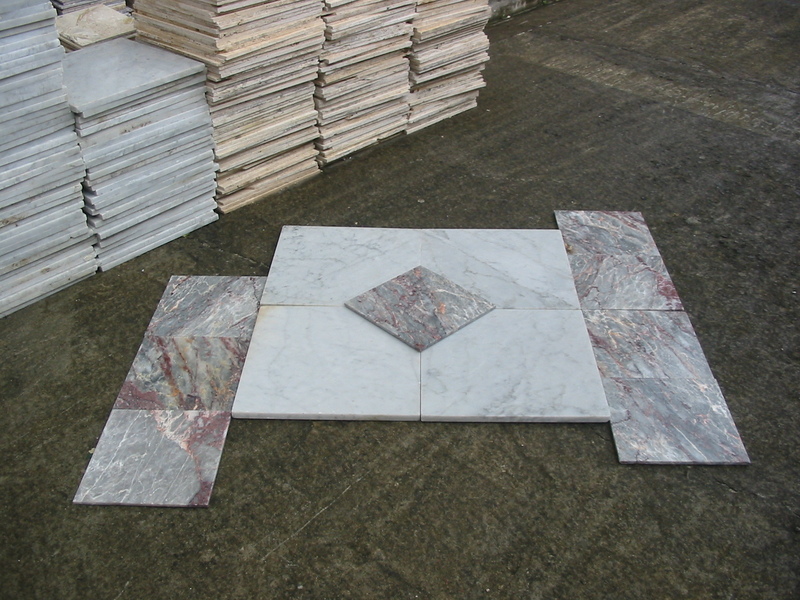 The next phase in the renovation works was the tiling of the floor with marble tiles, donated by Food For the Poor (USA). I prepared a beautiful lay out with the diverse tiles. 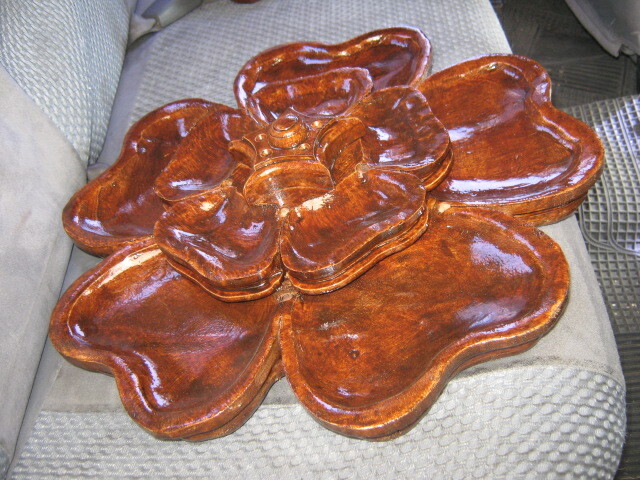 Francis Daisy did the tiling in July 2008. New pews were constructed in the SMA workshop as funding became available. 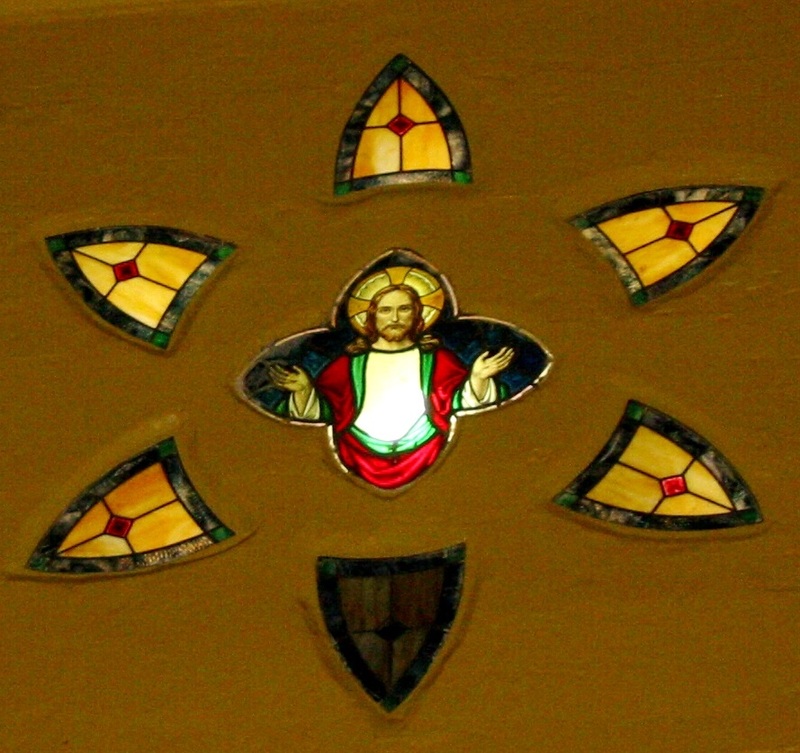 Since hurricane David, the once beautiful stained glass windows were in deplorable and damaged condition. Below are some of my photographs of the damaged windows. In May 2014, Kelvin Cardinal Felix, Parish priest of St. Mark’s, installed three new Stained Glass windows, designed and produced by Vison Art Glass in Canada. It is the cardinal’s hope to continue the replacement of all the 18 windows. 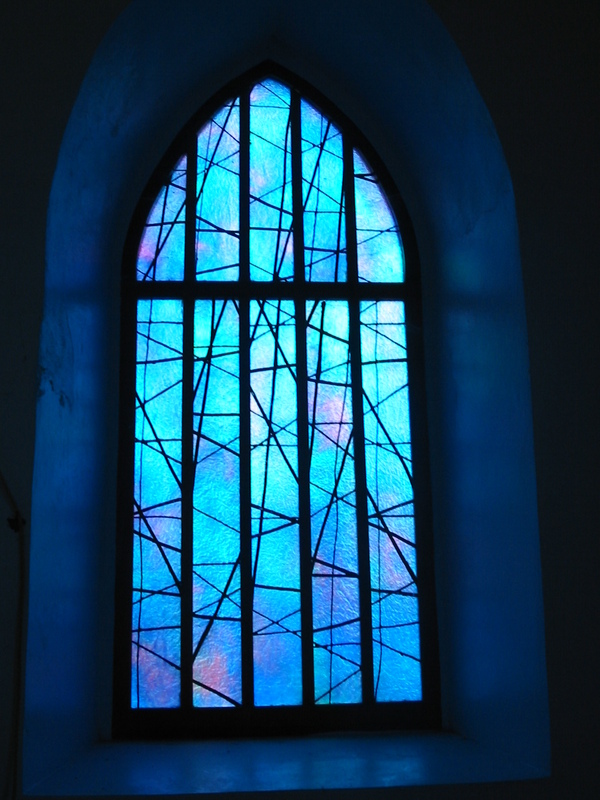 Since hurricane David, the once beautiful stained glass windows were in deplorable and damaged condition. 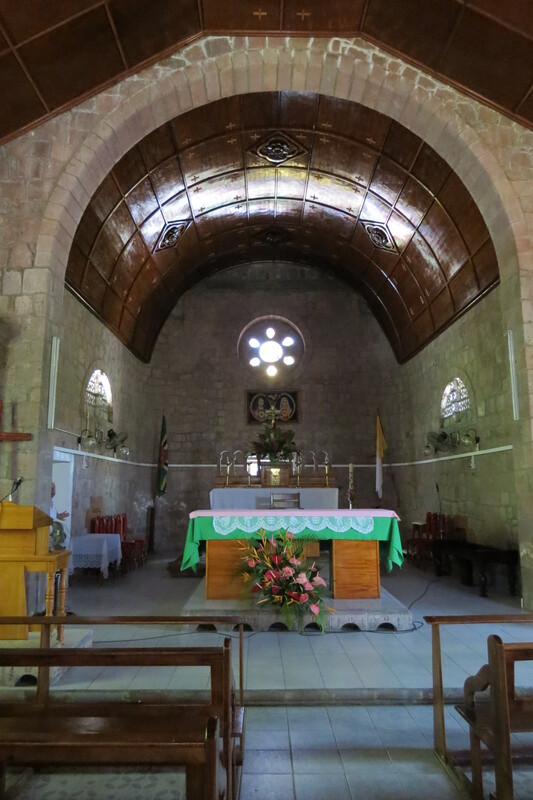 This entry was posted in OLD CHURCHES and CHAPELS, RENOVATED CHURCHES, Soufriere church, Upgrading of Liturgical spaces and tagged catholic, catholic chapel in Dominica, Dominica churches, liturgical space, Place of Worship, Soufriere church Dominica on October 19, 2016 by Bernard Lauwyck. 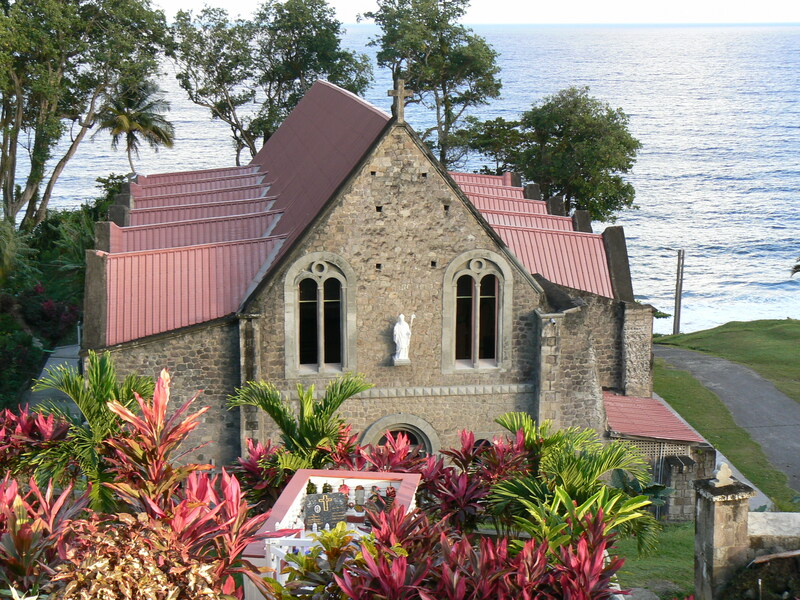 The St. Paul and St. Ann church in Massacre is one of the most beautiful churches in Dominica. In 1987, I worked with Fr. Franklyn Cuffy C.Ss.R. to construct a new roof and install a roof covering. Many years later, I got the opportunity to bring out the beauty of this church in and out, when Fr. Rodney Olive C.Ss.R. 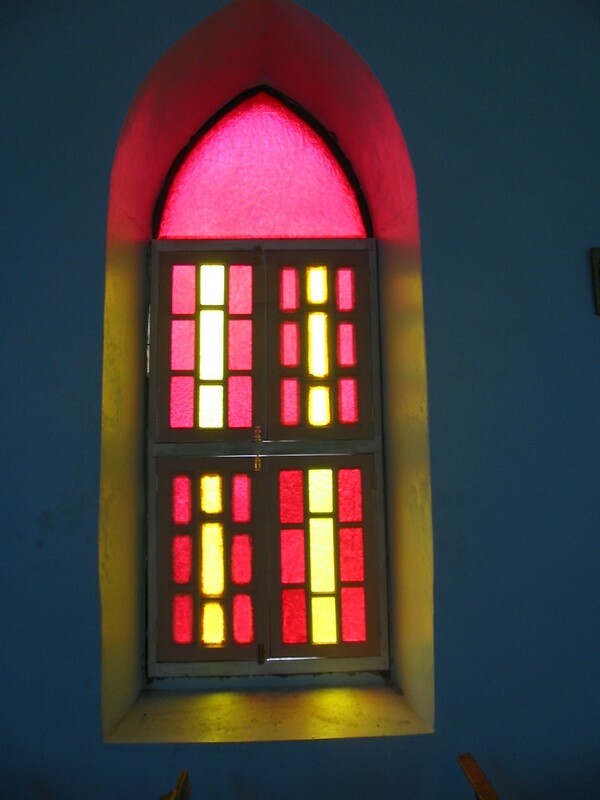 teamed up with Mrs. Nancy Nassief to bring Caribbean colours to this church. The colour scheme proved quite durable as 10 years later the Massacre church still looks fabulous !!! 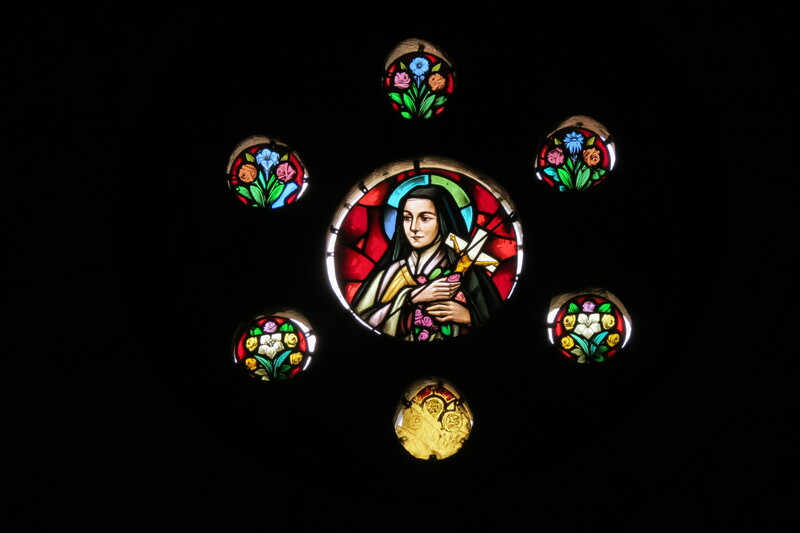 The stained glass windows were renovated by Bernard Clerici when Fr. Clement Jolly was Parish Priest. 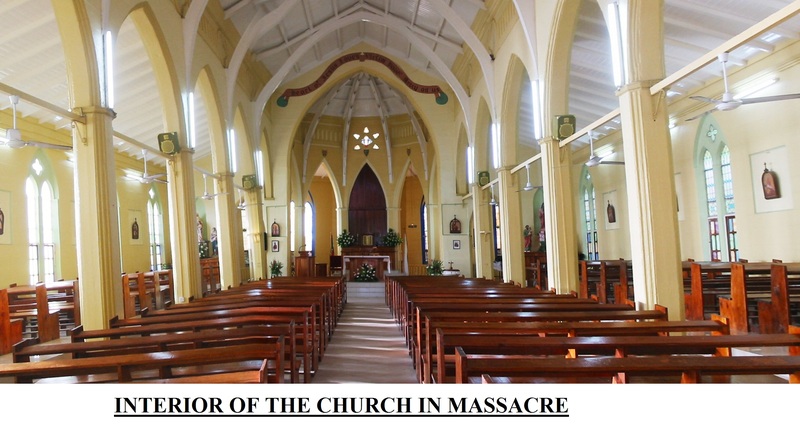 This entry was posted in MASSACRE CHURCH, OLD CHURCHES and CHAPELS, Sunday Mass at 7 am and tagged Massacre church, st Ann and St. Paul on October 19, 2016 by Bernard Lauwyck. On 25 November 1866, René Marie- Charles Poirier, third Bishop of Roseau wrote to the Propagation of the Faith in Rome “The parish of “Grande-Baie”, ancient mission of the Jesuits, has been abandoned since. The chapel is in ruins, without roof, without door, without windows, and overtaken by bushes ” After the Jesuits abandoned their Geneva estate before 1764 , the Catholic Church never regained possession of the Geneva estate although the use of the chapel and burial ground on that estate continued. This was not without problems. In 1844 there was a violence in the Grandbay area and one of the reasons was “that the attorney of these properties had caused the Roman Catholic Chapel on the Geneva Estate to be locked up which gave great offence”. Attempts by Bishop Poirier in 1866 to secure the portion of land around the chapel for the Catholic Church from the Geneva estate legal owners proved unsuccessful, so a new church was built at the outskirts of the Geneva estate. 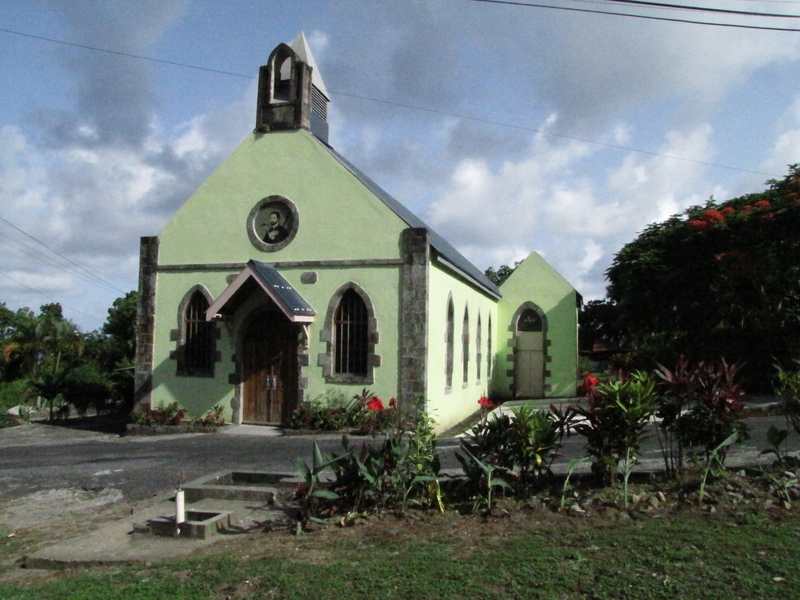 This parish church, located in the neighbourhood of the present church tower, was the first church in Dominica to be solemnly consecrated. This was in early 1905. The first time we read about the present parish church in Grandbay , outside the Geneva Estate, is in the Ecclesiastical Bulletin of 1919: “The Bishop left Roseau for Grandbay on April 28, 1919 and held, on the following day, the confirmation service, after the Solemn High Mass, sung by the Rev. Fr. Baudry, FMI, Parish Priest of La Plaine. The presence of 8 priests in the sanctuary enhanced the solemnity and the impressiveness of the Divine Service. 250 confirmation candidates, with their godfathers and godmothers, filled the church. It was, on this occasion, observed once more that the large parish of Grandbay needed a larger church. Rumor has it that the parish priest Fr. Francois had renounced his plans to enlarging the present parochial church, and was, with the Bishop’s approval, determined upon building a new, spacious church.” The parish had increased to well over 4,000 inhabitants, nearly all Catholics. It was decided to build a new church, much larger and much more beautiful than the existing one. Works were started in 1921 and it was considered that it would require 2 years to complete. But, owing to the unforeseen rise in the cost of building materials all available money was spent long before the walls were finished and the people, on account of the trying times, were unable to help, though they showed much good will in voluntary labour. 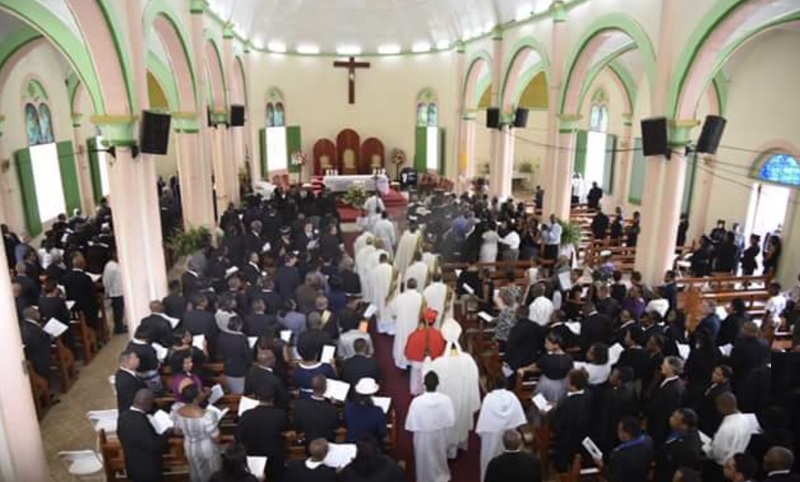 (sources The Ecclesiastical bulletin of Roseau and the history written by James Moris) . 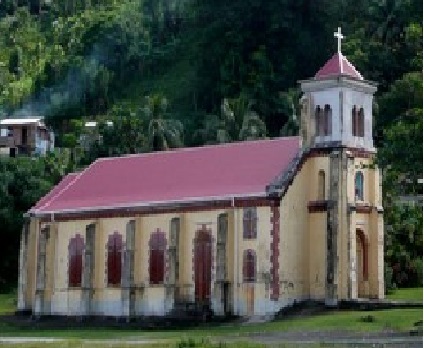 (sources The Ecclesiastical bulletin of Roseau and the history written by James Moris) The present church was renovated with rust proof Aluminium sheets in 1989. At that time it lost the “gargoyles” or waterspouts, an architectural element which reminded the parishioners of devils. The floor was beautifully tiled by Fr. Krastel C.ss. R with a financial grant from Fr. Albert Lamothe (+ 2010). He also expanded the cemetery. Fr. Mark Owen C.Ss.R set up a hardworking pew or bench committee under the chairmanship of president Liverpool. He also replaced the concrete blocks in the windows with timber shutters with stainless steel hooks and stained glass, redid the sacristy, built the choir stalls in the choir loft, and installed a new PA system. Very Rev. Fr. Mark Owen C.Ss.R also brought out the beauty of the architecture of this church by painting it with the colours green and gold/orange, colours associated with the Irish saint St. Patrick. In 2010, Most Rev. 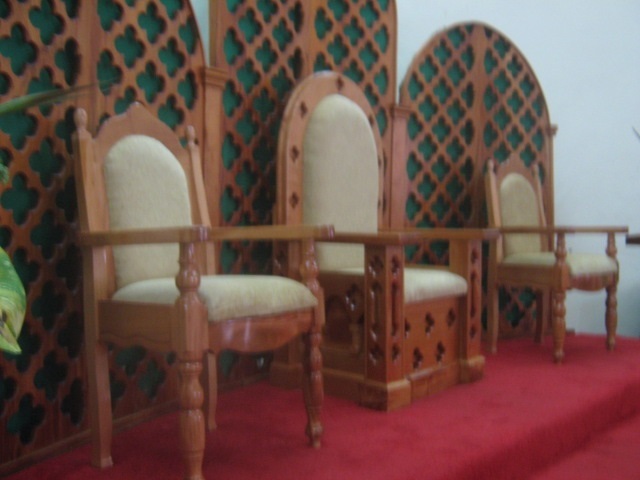 Kelvin Felix, archbishop emeritus, replaced the rest of the church pews and added the sanctuary screen and celebrant’s chair. 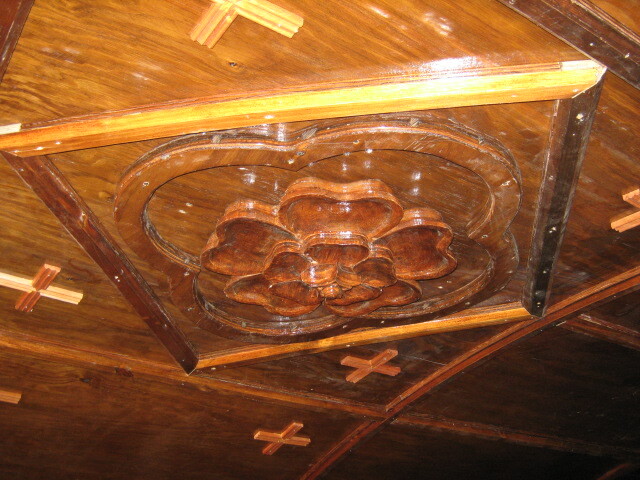 Some of the old wooden church pews, still made with hand tools, were salvaged and refinished. 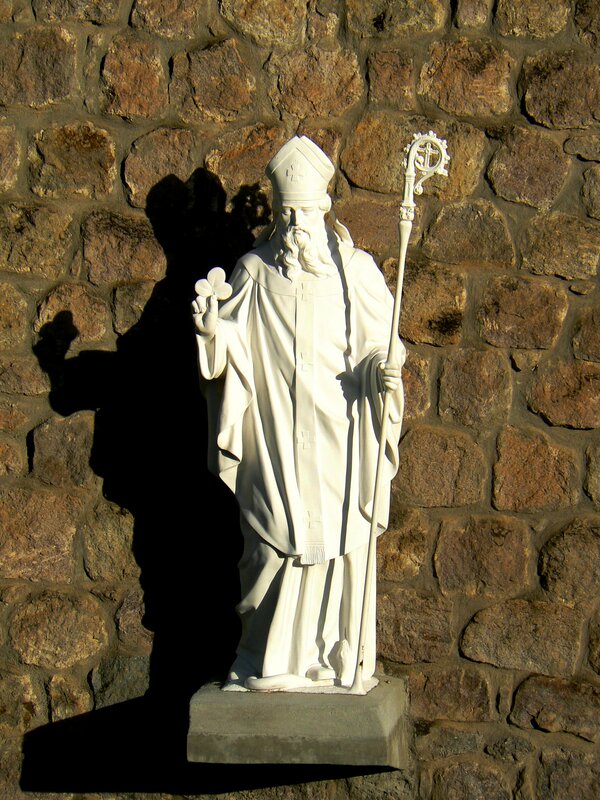 The beautiful church, which you should visit, reminds each of us of the strong faith of the parishioners of St. Patrick’s parish, both past and present. This entry was posted in DESTROYED by hurricane MARIA 2017, OLD CHURCHES and CHAPELS, St. Patrick's church in GRANDBAY, Sunday Mass at 7 am and tagged Grandbay church, St. Patrick on October 19, 2016 by Bernard Lauwyck. 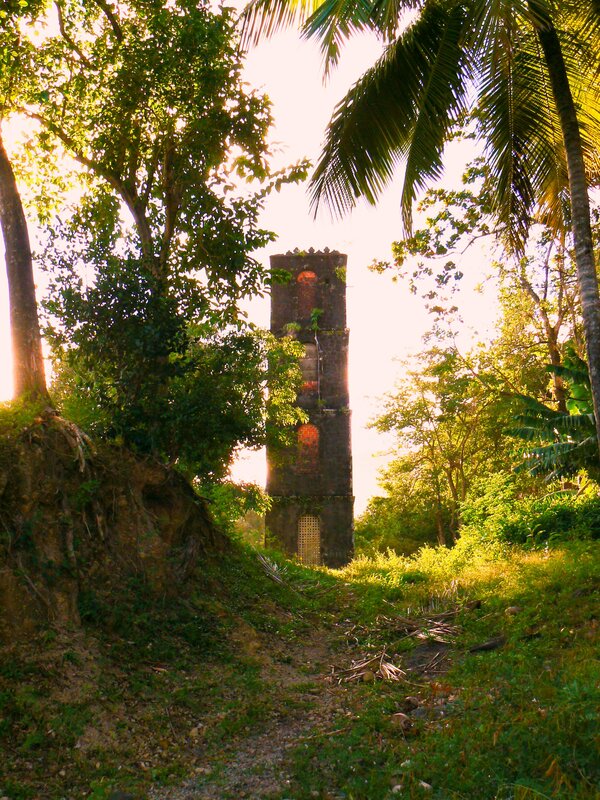 The Parish Church of the Parish of San Sauveur was destroyed many times by hurricanes in its history. 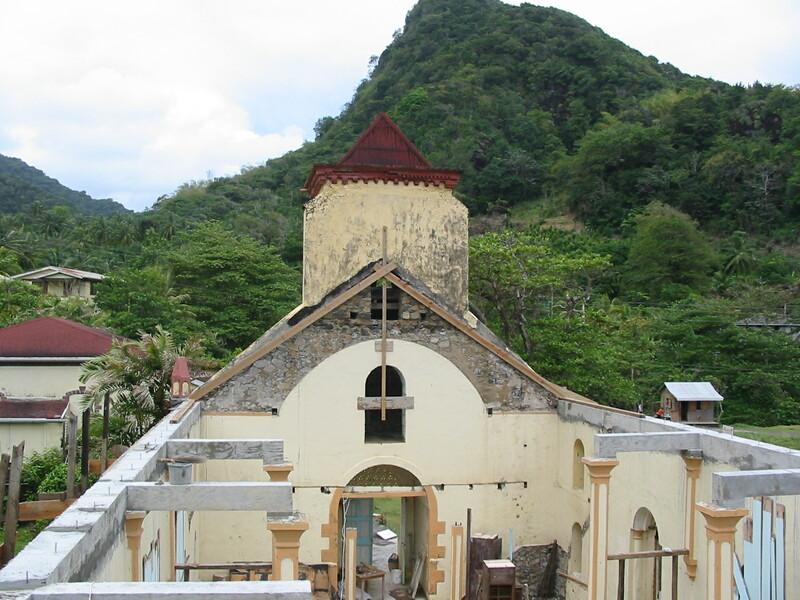 Its history speaks to the resilience of the Catholics of Pte Soufriere, San Sauveur and Good Hope and the tenacity of the FMI missionaries who worked with among them. Its location on the edge of GRAND MARIGOT bay, close to the Atlantic Ocean, has caused it to suffer greatly from a deeply penetrating sea blast and heavy winds. On the sixth of August 1864, Bishop Poirier took possession of a large area that he managed to purchase for a very low price on the windward side of Dominica. In memory of the church that he blessed in his hometown Redon (in French Brittany ), he called the property “Saint-Sauveur”. It was also known as Grand Marigot. It comprised a complete valley with two hills full with trees. It is watered by two rivers that empty in the Atlantic Ocean in a magnificent bay. 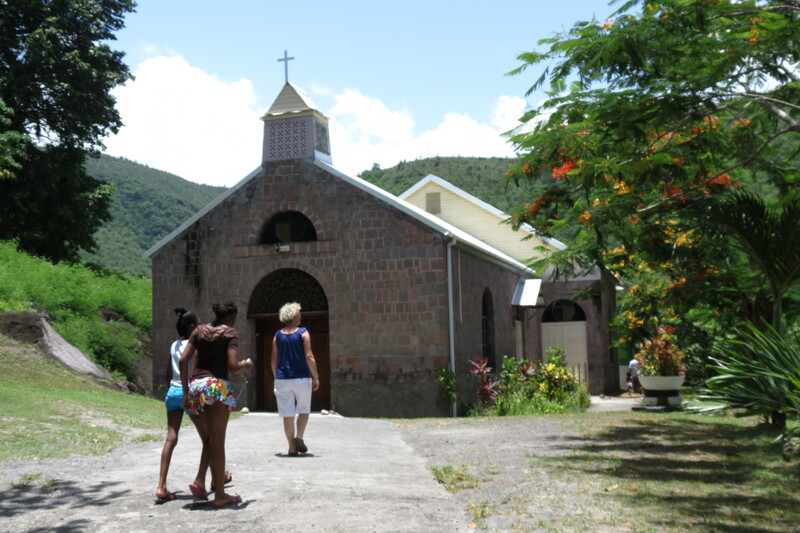 At Sauveur , there was neither church nor chapel; and at Petite Soufriere, about one mile to the south of St. Sauveur, Bishop Poirier offered Holy Mass in the house of Mr. St. Ville, a local patriarch. 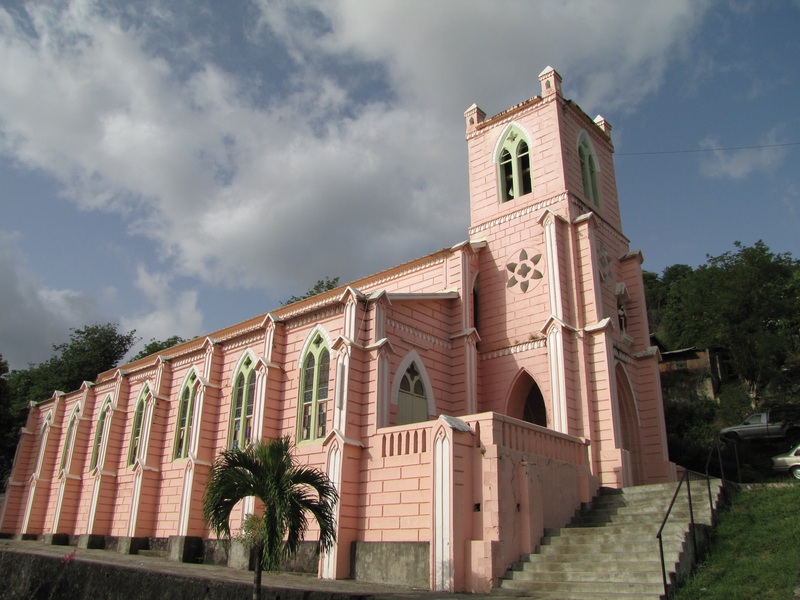 In February 1872 the Sons of Mary Immaculate (FMI) , or Fathers of Chavagnes, arrived in Dominica. 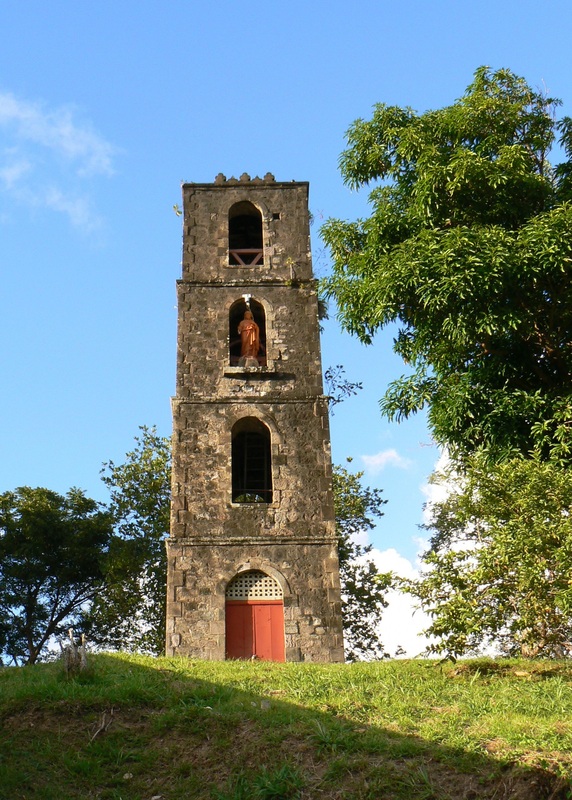 The parish of St. Sauveur, stretching from the Pagua River in the North to Delices in the South was confided to the care of Fr. Rondard, F.M.I., who was soon succeeded by Fr. Challet, F.M.I. Father Berthomé FMI was appointed parish priest of St. Sauveur in 1877. He started the first parish church in masonry at San Sauveur, which was solemnly blessed and opened for divine service in August 1879. When Bishop Naughten paid his first pastoral visit to the district in June 1880, the church at St. Sauveur was finished, but had no doors and windows. Sadly enough, three years later, in September 1883, a hurricane badly damaged the new church. Fr. Berthomé set out to repair the damage done to the church and built a brand new presbytery. On August 28th 1913, a terrible hurricane struck the island again. The parish church of St. Sauveur, a massive stone-building, erected by Fr. Berthomé FMI , was reduced to “a heap of shapeless ruins”. Fr. Justin Delès FMI started a new church building in 1918, which was solemnly blessed on the 18th April 1923, dedicated to the Holy Saviour. This church lost its roof during the hurricane of September 1930. In 1965, a new roof was constructed by Fr. Michel Baty FMI. Between 1967 and 1968 the church was completely renovated and new pews were installed. 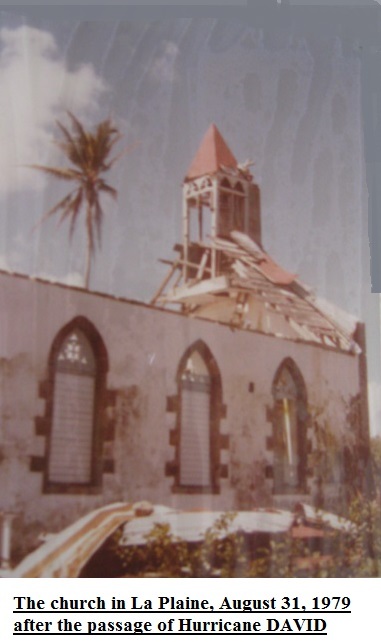 On August 29,1979 hurricane DAVID destroyed the roof of the church once more. Materials had to be brought in by boat to repair both the church and the presbytery. 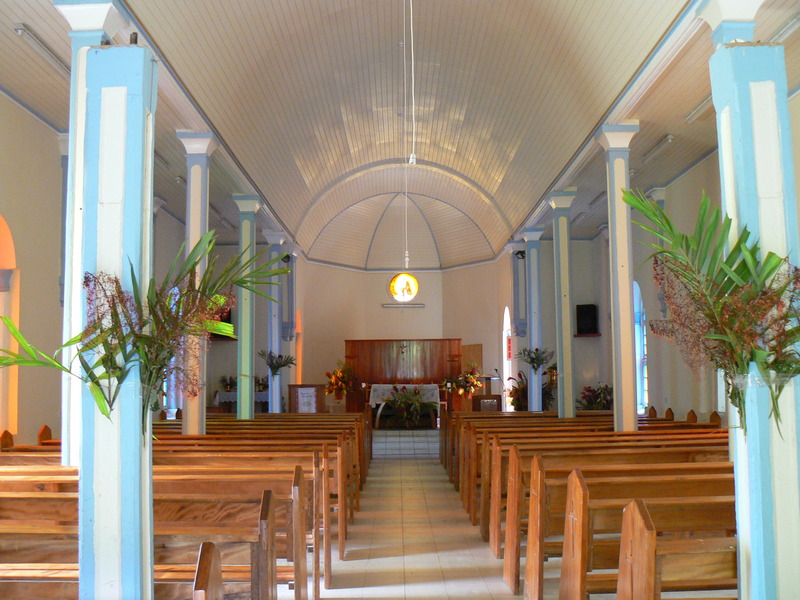 The latest renovation of the San Sauveur church was initiated by Rev. Fathers Jean Martin FMI and Michel Favalier FMI. Fr. 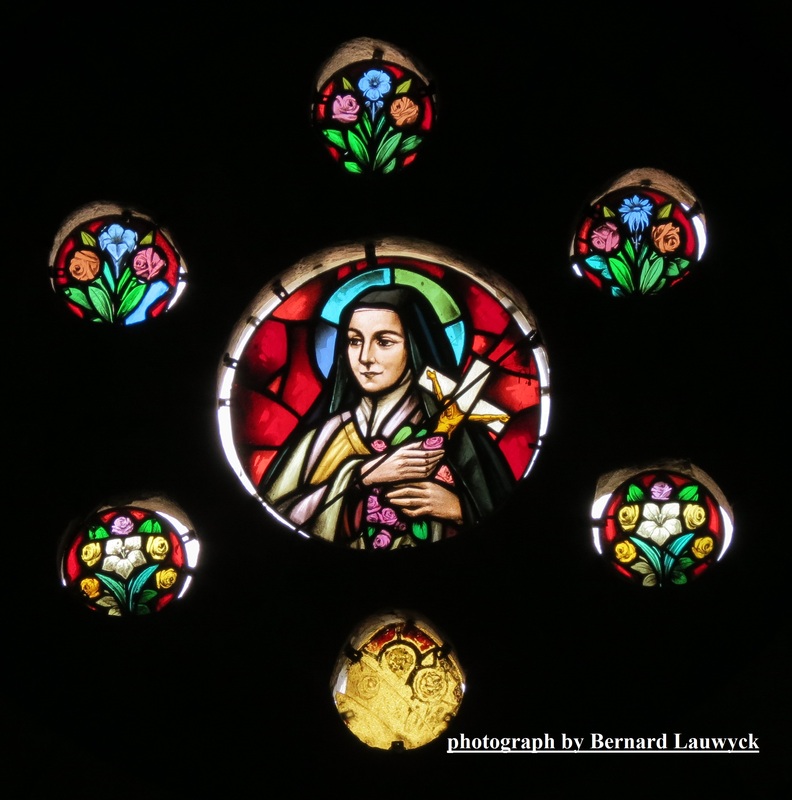 Jean Martin renovated the windows and placed green, yellow, blue, burgundy plexiglass panes which enhanced the feeling of church. He also collected White Cedar boards in the parish and let the SMP workshop construct new pews. in 2003, Fr. Michel Favalier started the replacement of the roof as the church was leaking badly. This and additional renovation was completed under Fr. Herman Sharplis FMI by 2006. Financial assistance was obtained from the German Conference of Bishops through ADVENIAT and the Congregation for the Propagation of the Faith in Rome. The great assistance, in cash and in kind, of a twinning St. Anthony parish in the US, under the leadership of Fr Len Wenke, was extremely helpful. St. Anthony’s purchased on my advice stainless steel bolts and shipped them down. I also specified stainless steel roofing sheets, hinges, nails and hurricane ties, all of stainless steel quality. The shutters were constructed in Coubaril timber. The local contractor was Mr. Donald Augustine, who did a commendable job. Teacher Cynthia Stevenson spearheaded the local fundraising. The church, once parish church of the San Sauveur Parish, has been the location of many “heritage day” celebrations and is a pride to its community. 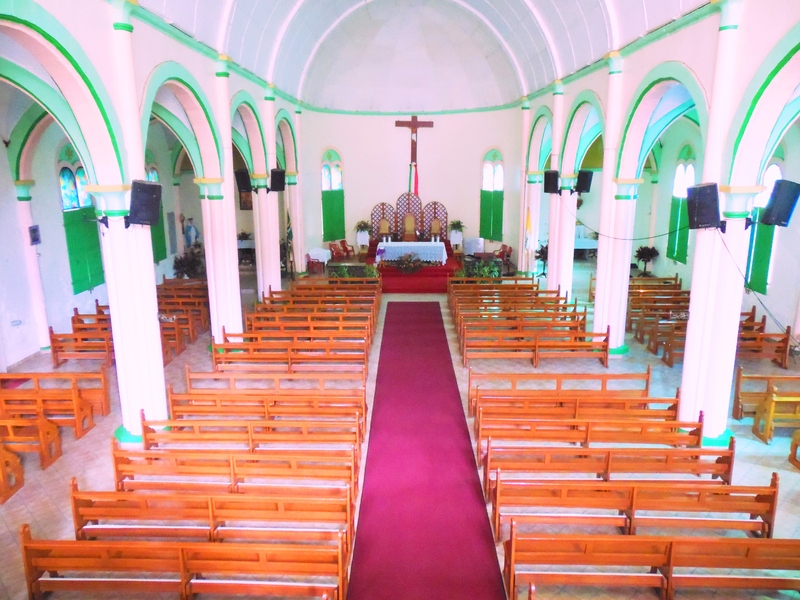 This entry was posted in OLD CHURCHES and CHAPELS, RENOVATED CHURCHES, San Sauveur church and tagged San Sauveur in Dominica, the church of San Sauveur on October 18, 2016 by Bernard Lauwyck. became the task of the newly arrived FMI Missionaries from France. (FMI) or Sons of Mary Immaculate arrived in Dominica on February 7th, 1872.
without any outside help or support. there today” , was completed and dedicated to St. Francis Xavier. Gradually Fr. entirely destroyed. Luckily the La Plaine church only suffered minor damage. the hands of Fr. Ferdinand Baudry FMI. ground the schoolhouse of La Plaine. All the damaged buildings were repaired and the schoolhouse raised from its ruins. 1928 by Father Chaigneau FMI, a young and energetic priest. lost his health through overwork and had to leave the island early in 1932. Father Joussement succeeded him . then inhabited by the DJ sisters. DEI” as can be seen above the side entrance of the La Plaine church. This entry was posted in LA PLAINE CHURCH, RENOVATED CHURCHES and tagged La Plaine, La Plaine church, St. Francis Xavier on October 18, 2016 by Bernard Lauwyck.